The other day I was just minding my own business when suddenly a brilliant idea struck me: Chocolate Easter egg brownies. That’s right. I love brownies. They’re absolutely, mouthwateringly delicious on their own, but by adding just one or two ingredients you can spruce them up and make them even more special (take these Rolo and sea salt brownies, for example). Plus, they’re extremely easy to make – you can barely mess these up, I promise (I say barely, because a while back I managed to burn some chocolate when trying to melt it). 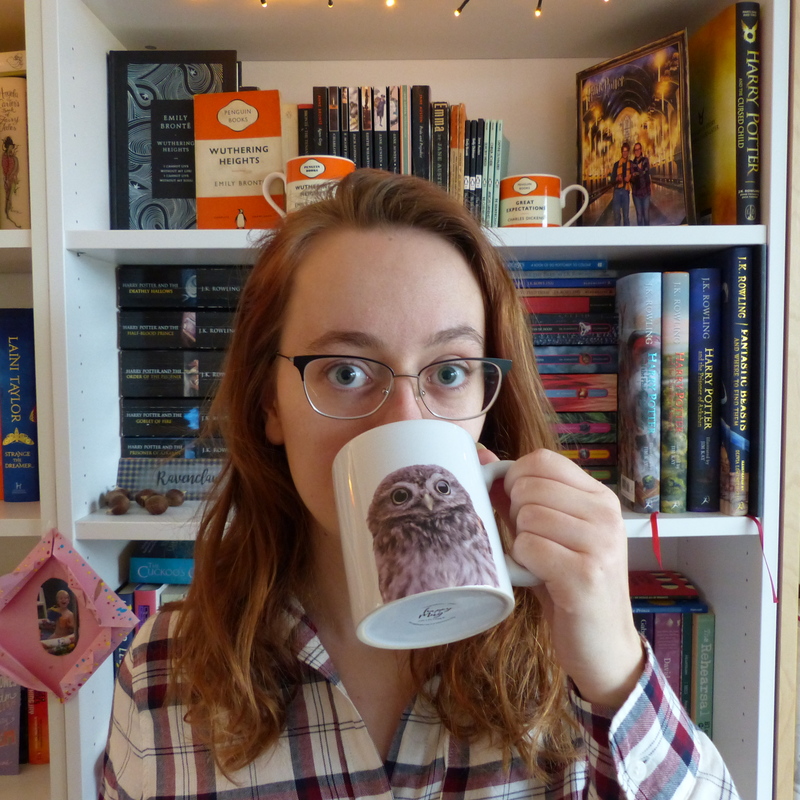 Although I know chocolate is a pretty big part of Easter in most countries, I’m also quite sure every country does their chocolate Easter eggs a little bit differently, although I might be wrong. In the Netherlands, we’ve got small chocolate eggs in dark, milk and white chocolate. They come as solid pieces of chocolates, but there are also a ton of varieties of filled chocolate eggs. For these brownies I bought a bag of eggs that came in four different flavours: milk pecan caramel sea salt, milk hazelnut almond praline, dark almond coconut, and white pistache praline. Sounds delicious, right? Little bursts of flavour within an already delicious brownie. You could choose whatever your like for your own chocolate egg brownies, although I would recommend choosing filled eggs instead of solid ones. Hope you enjoy! Happy Easter everyone! How was your day? Lots of chocolate, I suppose? What with Easter being a perfect holiday for delicious baked goods, I figured I had to bake something scrumptious this weekend. 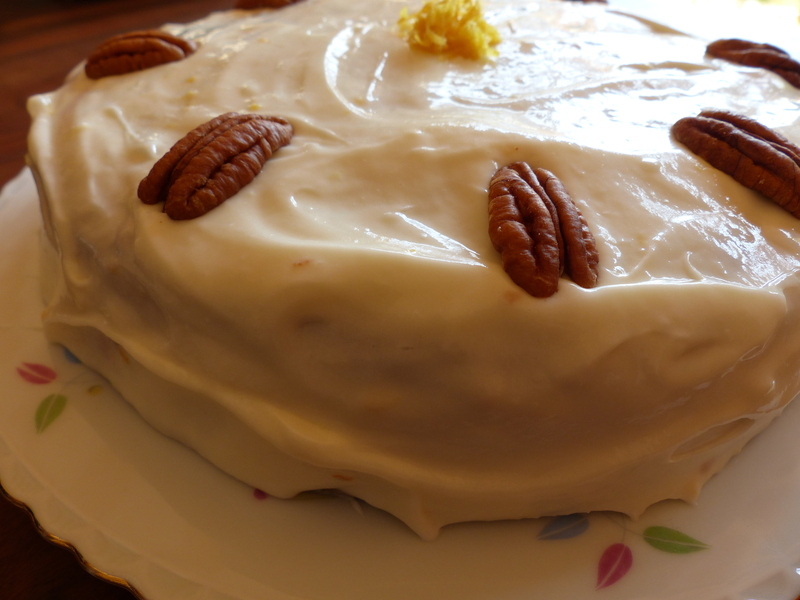 My mind went immediately to a carrot cake, a bake I’d never made before and seemed perfect for Easter. I think the thought process went something like “carrot – rabbits – Easter bunny”, although that didn’t happen deliberately. 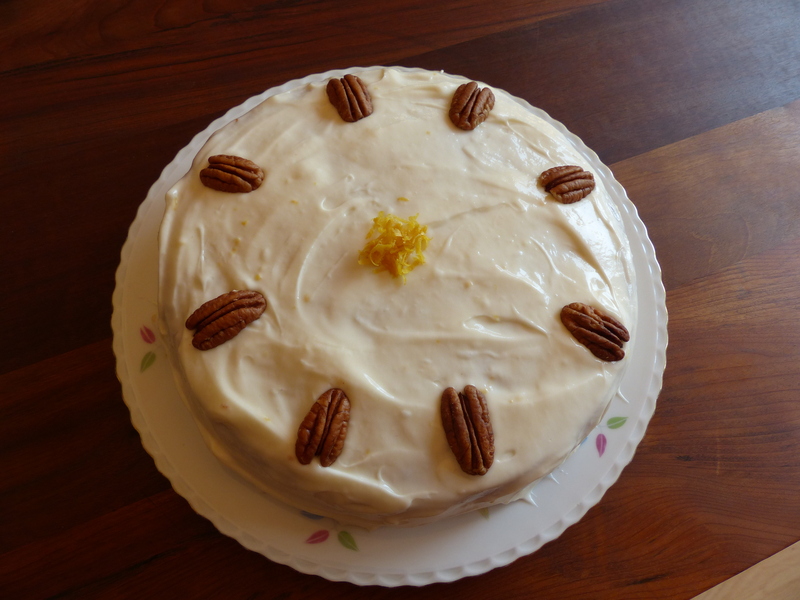 Anyway, on Saturday morning I browsed through some of my baking books and the internet and eventually I put together my own recipe, for what I thought would make a delicious carrot cake with pecans and a nice lemon-y frosting. It was very easy to make and came out absolutely wonderful! 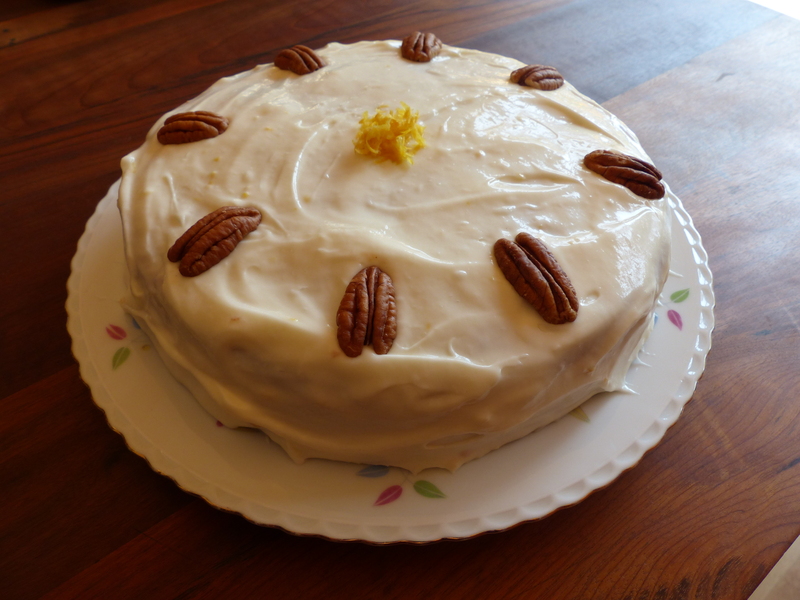 The cake has a beautiful texture and a nice cinnamon taste which is complemented in a lovely way by the frosting, which has a hint of lemon. 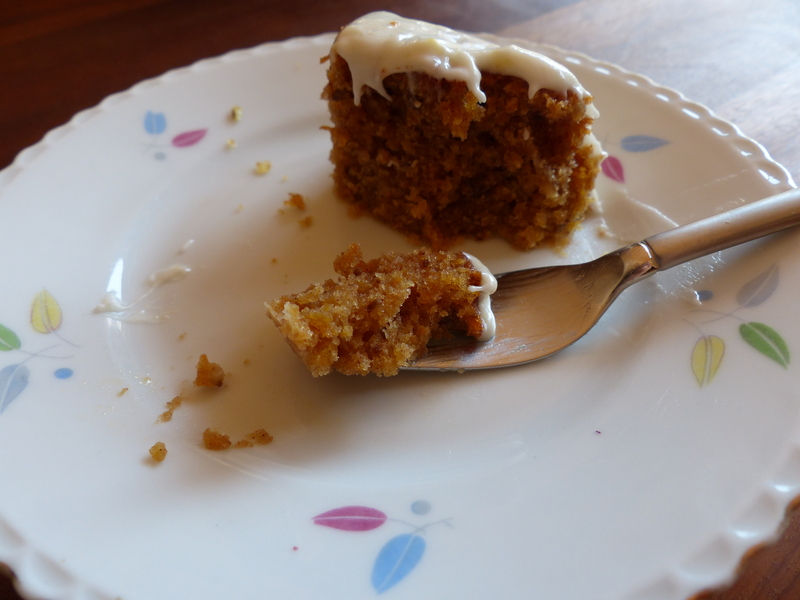 If you want the cinnamon taste to be less dominant, just use a bit less cinnamon (obvious, eh?) or perhaps a bit more ginger for a more ginger-y taste. I am very proud of how this cake turned out, I hope you’ll like it too if you decide to make it! 1. Mix together eggs, oil, sugar and vanilla First of all, you need to beat together the eggs and the sunflower (or vegetable) oil, and then add the two types of sugar and the vanilla flavouring and mix until everything is evenly mixed. I just used a whisk for everything. 2. Add flour, baking powder, salt, cinnamon and ginger Next up, you’ll have to add the flour and the baking powder and mix it through, and do the same with the salt, the cinnamon and the ginger. As I said above, you can adjust the amounts of cinnamon and ginger to your taste. 3. 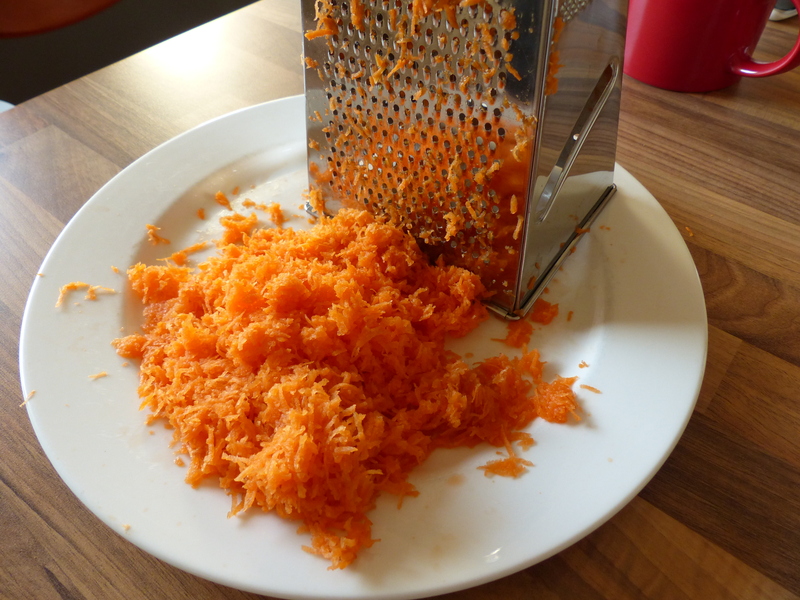 Add carrots and pecans Now, stir in the grated carrots and then also add the chopped pecans. Mix everything until your mixture is nice and smooth, which shouldn’t be too difficult; such an easy recipe, and so delicious! 4. Prepare the tin and bake the cake Line the base of your springform tin with parchment paper and grease and flour the entire tin. Then pour in the mixture for your cake. You’ll probably won’t have to smooth anything because the mixture is quite runny. 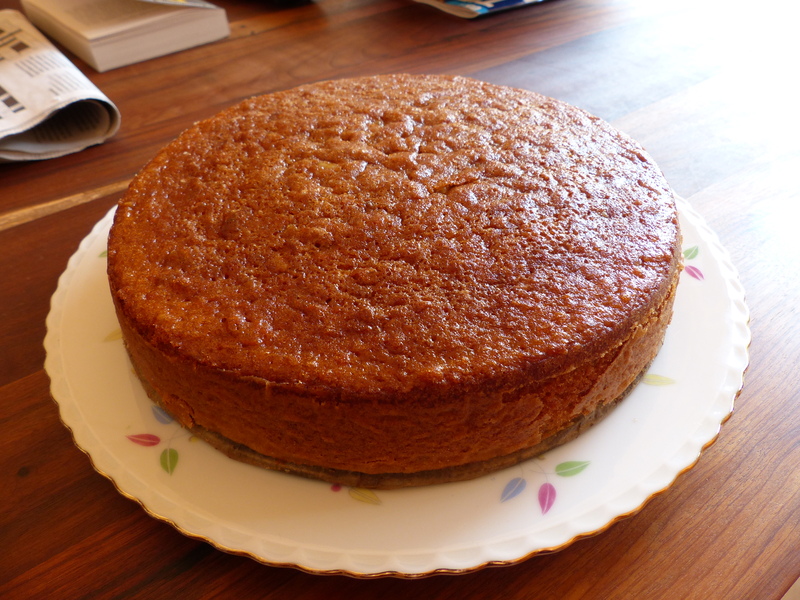 Put your cake into the preheated oven and bake the cake for 35 to 45 minutes. Check the cake after the first 35 minutes by inserting a skewer; if it comes out wet you’ll need to bake the cake a bit longer. If that’s the case, just check again after 5 extra minutes of baking. 5. 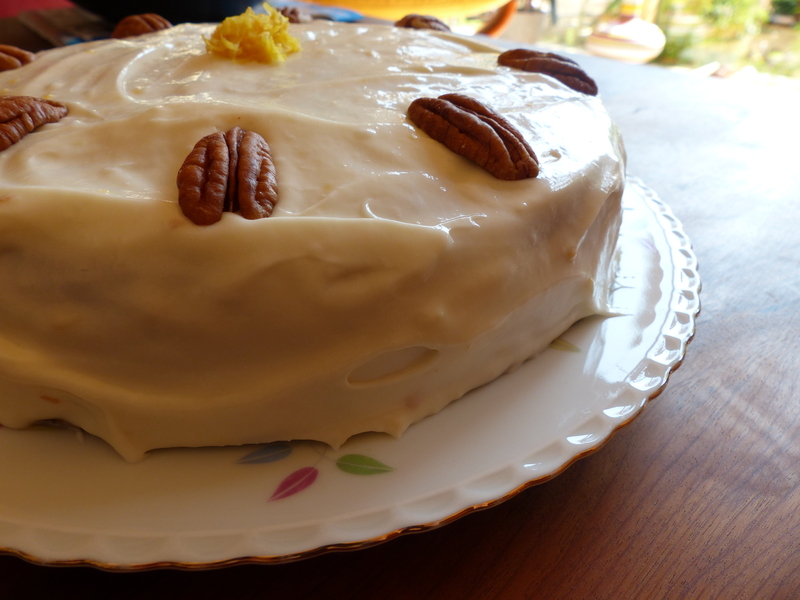 Make the frosting After your cake has cooled you can coat it with the frosting, which you prepare by mixing the cream cheese, buttermilk and vanilla flavouring together with an electric mixer, after which you gradually mix the icing sugar through it. Then add the zest of about half a lemon. 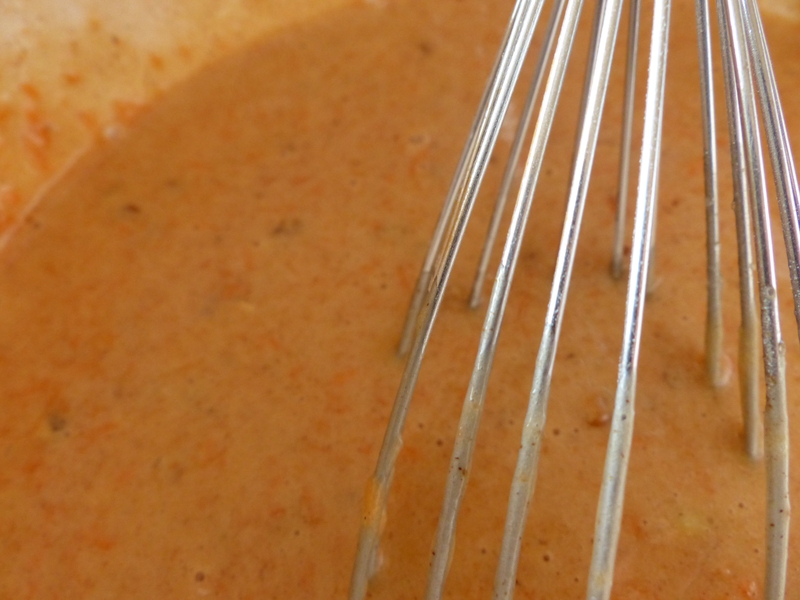 Just gradually add the zest and taste after mixing if you think it’s right! 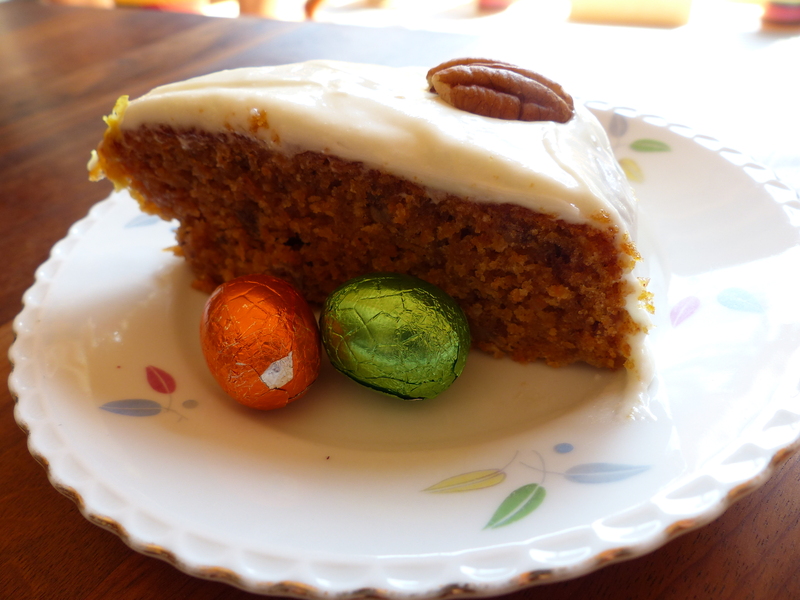 And that’s all to make this delicious easter carrot cake! Enjoy! I had quite a bit of frosting left over since I don’t usually use a lot of frosting (and it was just too much), so I whipped up a small batch of cupcakes to coat with the remaining lemon frosting. 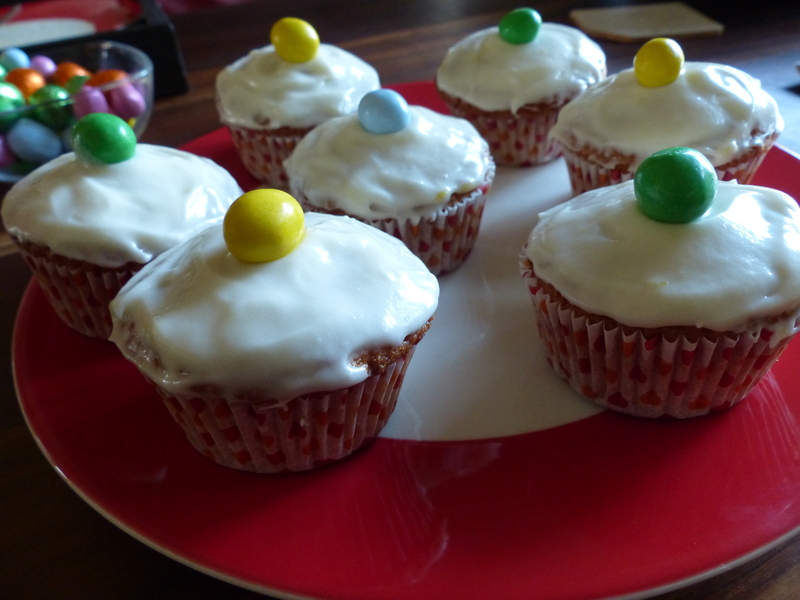 I decorated them with the limited edition of Easter M&M’s.